An economical algaecide that works great against the most common algae types found in ponds and lakes. You don’t have to spend more money on exotic algaecides when the standard barrier liquid copper can get the job done fast and effectively. Alligare liquid algaecide can be applied directly from the jug or mixed with water to help facilitate distribution. Hand-held or Back-pack sprayers make the job even easier. Sample 50' x 50' Pond (.06 acre) 3 ft avg depth. Sample 100' x 100' Pond (.23 acre) 3 ft avg depth. 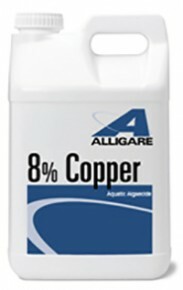 Water Use Restrictions: Water treated with Alligare 8% Copper can be used immediately for recreational activities, for drinking, for watering livestock, and for irrigation of crops, golf courses, ornamental plantings, and turf areas. The Alligare Algaecide Liquid Product Label is available for download in pdf.